The first international release on Austin Boogie Crew Records comes courtesy of Swedish producer Lowmac! Heavily influenced by West Coast hip-hop artists in his youth, Lowmac draws upon the G-Funk sound in his dynamic boogie and modern funk music. On his first-ever vinyl release, Lowmac offers two slices of future funk goodness on this bangin’ ABC 45! 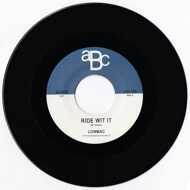 “Ride Wit It” is a party starting banger with an infectious lead, driving handclaps, and an array of synths that weave in and out of the track’s steady groove. “Late Nights” is the perfect cruising jam, carried by a smooth bassline and G-Funk synths. Imagine bright neon lights and good times.